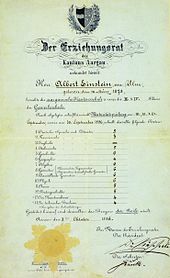 Einstein's matriculation certificate at the age of 17, showing his final grades from the Argovian cantonal school (Aargauische Kantonsschule, on a scale of 1–6, with 6 being the highest possible mark). He scored: German 5; French 3; Italian 5; History 6; Geography 4; Algebra 6; Geometry 6; Descriptive Geometry 6; Physics 6; Chemistry 5; Natural History 5; Art and Technical Drawing 4. 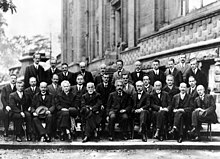 Albert Einstein at a session of the International Committee on Intellectual Cooperation (League of Nations) of which he was a member from 1922 to 1932. 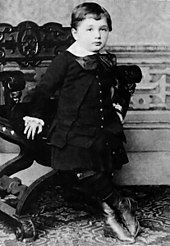 Einstein, Albert (1905c) [Manuscript received: 11 May 1905]. Written at Berne, Switzerland. "Über die von der molekularkinetischen Theorie der Wärme geforderte Bewegung von in ruhenden Flüssigkeiten suspendierten Teilchen" [On the Motion – Required by the Molecular Kinetic Theory of Heat – of Small Particles Suspended in a Stationary Liquid]. Annalen der Physik (Berlin) (in German). Hoboken, NJ (published 10 March 2006). 322 (8): 549–560. Bibcode:1905AnP...322..549E. doi:10.1002/andp.19053220806. hdl:10915/2785 – via Wiley Online Library. 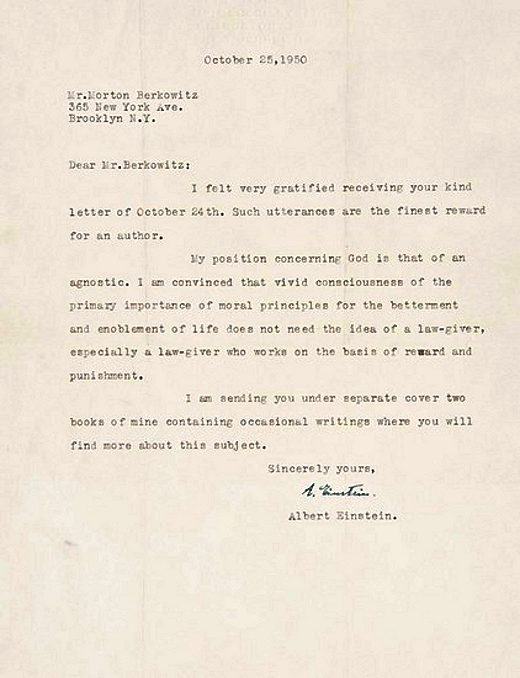 Einstein, Albert (1905d) [Manuscript received: 30 June 1905]. Written at Berne, Switzerland. "Zur Elektrodynamik bewegter Körper" [On the Electrodynamics of Moving Bodies]. Annalen der Physik (Berlin) (Submitted manuscript) (in German). Hoboken, NJ (published 10 March 2006). 322 (10): 891–921. Bibcode:1905AnP...322..891E. doi:10.1002/andp.19053221004. hdl:10915/2786 – via Wiley Online Library. Einstein, Albert (1923) [First published 1923, in English 1967]. Written at Gothenburg. 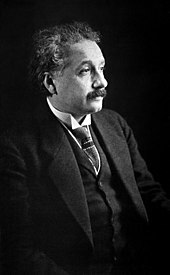 Grundgedanken und Probleme der Relativitätstheorie [Fundamental Ideas and Problems of the Theory of Relativity] (PDF) (Speech). Lecture delivered to the Nordic Assembly of Naturalists at Gothenburg, 11 July 1923. 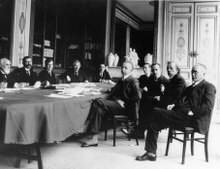 Nobel Lectures, Physics 1901–1921 (in German and English). Stockholm: Nobelprice.org (published 3 February 2015) – via Nobel Media AB 2014. 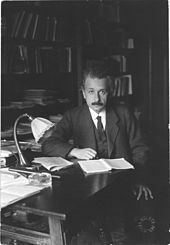 Einstein, Albert (1924) [Published 10 July 1924]. "Quantentheorie des einatomigen idealen Gases" [Quantum theory of monatomic ideal gases] (Online page images). 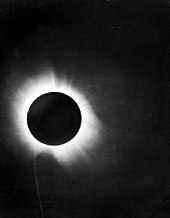 Sitzungsberichte der Preussischen Akademie der Wissenschaften, Physikalisch-Mathematische Klasse (in German): 261–267 – via ECHO, Cultural Heritage Online, Max Planck Institute for the History of Science. . First of a series of papers on this topic. 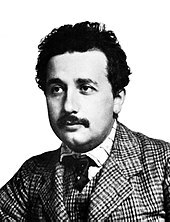 Einstein, Albert (1926b). Written at Berne, Switzerland. Fürth, R. (ed.). Investigations on the Theory of the Brownian Movement (PDF). Translated by Cowper, A. D. US: Dover Publications (published 1956). ISBN 978-1-60796-285-4. Retrieved 4 January 2015. 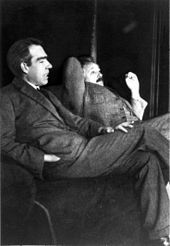 Einstein, Albert; Podolsky, Boris; Rosen, Nathan (15 May 1935) [Received 25 March 1935]. "Can Quantum-Mechanical Description of Physical Reality Be Considered Complete?". Physical Review (Submitted manuscript). 47 (10): 777–780. Bibcode:1935PhRv...47..777E. doi:10.1103/PhysRev.47.777 – via APS Journals. 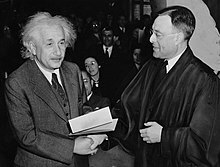 Einstein, Albert (9 November 1940). On Science and Religion. Nature. 146. pp. 605–607. Bibcode:1940Natur.146..605E. doi:10.1038/146605a0. ISBN 978-0-7073-0453-3. 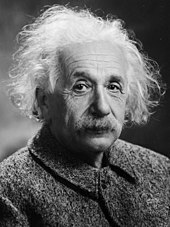 ^ Einstein, Albert (May 1949). Sweezy, Paul; Huberman, Leo (eds.). "Why Socialism?". Monthly Review. 1 (1). ^ Rowe, David E. & Robert Schulmann (8 June 2007). David A., Walsh (ed.). 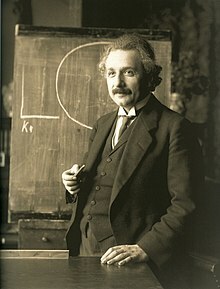 "What Were Einstein's Politics?". History News Network. Retrieved 29 July 2012. Fölsing, Albrecht (1997). 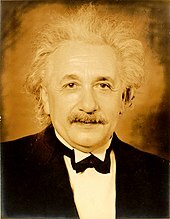 Albert Einstein: A Biography. Translated by Osers, Ewald. Abridged by Ewald Osers. New York: Penguin Viking. ISBN 978-0-670-85545-2. Fine, Arthur (2017). 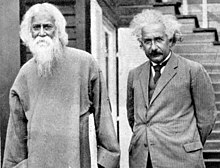 "The Einstein-Podolsky-Rosen Argument in Quantum Theory". Stanford Encyclopedia of Philosophy. Metaphysics Research Lab, Stanford University. Neffe, Jürgen (2007). 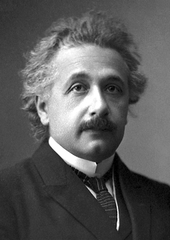 Einstein: A Biography. Translated by Frisch, Shelley. Farrar, Straus and Giroux. ISBN 978-0-374-14664-1. Stachel, John J. (1966). 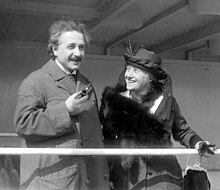 Albert Einstein and Mileva Marić (PDF). 9. unknown. Archived from the original (PDF) on 7 March 2008. Retrieved 13 May 2016 – via archive.org. Stachel, John J. (2002). 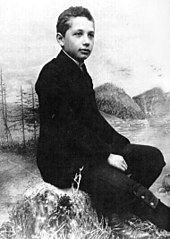 Einstein from 'B' to 'Z'. Einstein Studies. 9. Birkhäuser. ISBN 978-0-8176-4143-6. OCLC 237532460. Retrieved 23 March 2015. Oppenheimer, J. Robert (1971). Lecture delivered at the UNESCO House in Paris on 13 December 1965. "On Albert Einstein". 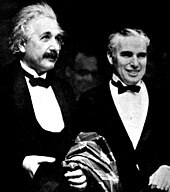 Science and Synthesis: An International Colloquium Organized by Unesco on the Tenth Anniversary of the Death of Albert Einstein and Teilhard de Chardin: 8–12, 208. , or "On Albert Einstein by Robert Oppenheimer". The New York Review of Books. 17 March 1966. Weinberg, Steven (2005). 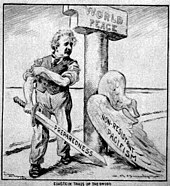 "Einstein's mistakes". Physics Today. 58 (11): 31–35. Bibcode:2005PhT....58k..31W. doi:10.1063/1.2155755. This page was last edited on 23 April 2019, at 01:33 (UTC).